We are a National & International Leisure Tour provider, However you will be completely pampered on your Choice of Destination. The quest for perfection always stands tall as the basic pre-requisite for success and glory and this approach has made Glorious Holidays Pvt. 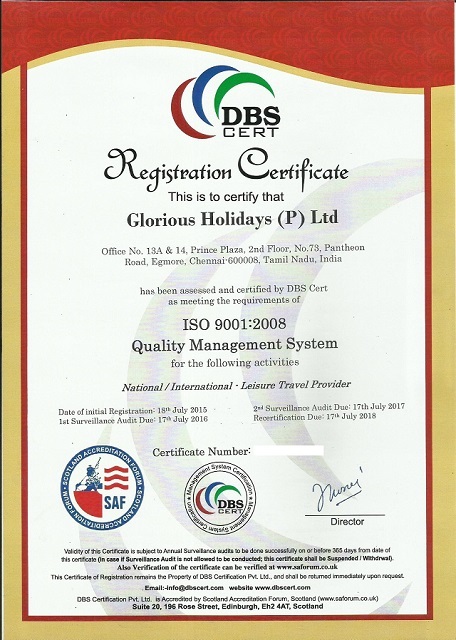 Ltd. travel places in the world of tourism. And as we travel to new areas as the time goes by, we have been making our clients travel all across the globe. With our base at Chennai in Tamil Nadu, we have been delivering a wide range of services with exemplary flawlessness ever since we started operations in the year 2004. We have scripted one success story after the other to emerge as one of the largest stakeholders in the travel world at present. Known as the leading Tour Operator, we also offer a wide range of services for the overall convenience of the traveler. The range of services comprises of Airline Ticketing Services, Rail Ticketing Services, Passport & Visa Services, Cruise Services, Hotel Booking Services, Services for Car & Coach Rentals, and Bus Ticketing Services and we are also known as a highly trusted Travel Insurance Agent. While the domestic locations of our tour packages cover the picturesque locations of Himachal Pradesh, Kerala, Sikkim, Kashmir, Goa and Rajasthan as well as the cities of Delhi, Nainital, Agra and Jaipur, you can also travel to the foreign shores of Switzerland, Singapore, Malaysia, Thailand, Hong Kong, Mauritius, Maldives, Kenya and Australia with us.